The spectre of seafarers losing their lives due to cargo liquefaction continues to blight the bulk carrier industry, writes Mike King. In January this year the Bulk Jupiter sank along with 18 crew off the coast of Vietnam. One crew member was rescued, two bodies were recovered and a further 16 crew, all from the Philippines, were presumed dead. The 56,000dwt, 2006-built vessel had loaded bauxite in Malaysia during the monsoon season and insurers were quick to issue a flurry of warnings about the dangers of liquefaction. Those worries were further heightened when the sole survivor, Rojas Angelito Capindo, the ship’s chef, reported that the ship sank very quickly for no reason discernible to the crew early in the morning. But it took until July before the cause of the loss was confirmed by the Flag State of the Gearbulk-owned vessel when Bahamas Maritime Authority (BMA) produced its report into the loss. As has been the case far too frequently in recent years, cargo liquefaction was found to be the only feasible reason to explain why the vessel and its crew were lost. Of course, the bulk carrier industry has been here before. Indeed, the trade in minerals from South East Asia on voyages into China has been the single-biggest cause of seafarer deaths on international trades for the last ten years in the global shipping industry, accounting for far more lives than piracy (see table) despite the tonnage carried over the period being miniscule in terms of volumes shipped annually on bulk carriers. While the IMO’s glacial reform process has improved matters, not least by adding nickel to the group of cargoes — Group A under the IMSBC Code — that can liquefy, BMA’s report concluded that far more needs to be done. DNV GL’s description of the “phenomenon” of liquefaction earlier this year was produced before the cause of the Bulk Jupiter loss was known, but the classification society anticipated the findings of BMA with uncanny prescience. The Bulk Jupiter sank on 2 January. It had previously loaded 46,400 tonnes of bauxite at the Malaysian port of Kuantan and had then sailed for the port of Qingdao in China. The vessel was relatively young — less than ten years old — and it had been strengthened for heavy cargoes. It entered the Bahamas register in 2011 and had dry-docked in Shanghai in May 2014, completing its Intermediate Survey in July of the same year. A Certificate of Compliance to the Maritime Solid Bulk Cargoes (IMSBC) Code was issued in April 2014. In short, the vessel was well-managed, operated responsibly by a reputable owner — Gearbulk — and was registered with a respected Flag State. So there were no obvious red flags associated with the vessel prior to its arrival in Malaysia. Instead, BMA found that the source of the loss was the state of the vessel’s bauxite cargo when it was loaded. The Bulk Jupiter was fixed under charter to carry a cargo of bauxite and arrived alongside the berth on 16 December 2014, but loading was not completed until 30 December due to frequent and prolonged periods of exceptionally heavy rain. While the rain was falling, hatch covers were closed but the cargo itself was not covered. Moreover, Kuantan port received the bauxite from a nearby open cast mine on open-topped trucks. BMA said that although the ship had been provided with a ‘Form For Cargo Information for Solid Bulk Cargoes’ issued by the shipper stating that the cargo comprised particle size ‘2.5–500mm 70–90%’ and moisture content at shipment of ‘10%’, it was observed that “these figures were identical to the Individual Schedule for bauxite in the International Maritime Solid Bulk Cargoes (IMSBC) Code”. During the course of the registry’s investigation, test results were taken from samples of the commodity loaded onto the Bulk Jupiter during the loading period of 17–30 December. The test report indicated that the average moisture content from ten lots was 21.3%. Results of moisture testing were also obtained from hold samples taken from another ship which was still loading at the time of the loss of the Bulk Jupiter.“Of 45 results the highest as-tested moisture content was 18.46% and the lowest 12.99%,” said BMA. Unlike most of the other reports into bulk carrier losses due to liquefaction — many of which were not made public without a great deal of pressure and which in some cases took far too long to be released even to victims’ families, as reported previously by DCI – BMA not only released its report promptly, it also admirably called for reforms to prevent further losses. 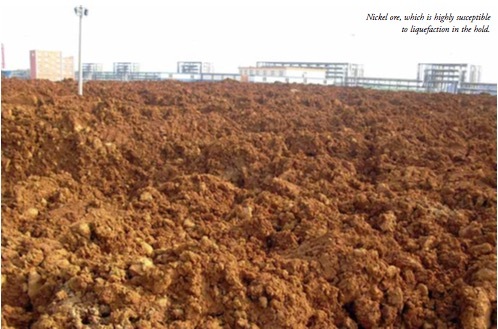 According to BMA, although the Individual Schedule for bauxite specifies a range of moisture content, the list of information to be provided to a Master does not include the requirement for the dimensional characteristics of the cargo. “In fact, and despite the fact that the schedule does specify a range with an upper limit of 10%, even moisture content and TML only needs to be communicated ‘in the case of a concentrate or other cargo which may liquefy’. BMA, which will present its findings to the IMO’s Sub- Committee on Carriage of Cargoes and Containers’ (CCC) second session over 14–18 September, would like the IMO to consider reclassifying bauxite as a Group A cargo which can liquefy. Alternately, the authority will request that the sub- Committee treat bauxite “as a cargo for which the Master should be automatically provided with the test certificates under 4.3.1 of the Code” and, where such test certificates are not supplied, are deficient in any respect “or have any other cause for concern” bauxite should then be treated as Group A cargo. BMA also called for test certificates issued for bauxite to clearly set out the actual proportions of lumps and powder of the cargo to be loaded as determined through testing and for additional weather precautions to be specified. BMA’s call for regulatory reform is no lone voice. DCI has long campaigned for tighter regulation and oversight of the world’s deadliest shipping trades — the carriage of minerals that can liquefy from South East Asia to China when loading occurs during the monsoon season. Dimitris Dedepsidis,Team Leader for Plan Approval and Ship Type Expert for bulk carriers at DNV GL in Greece, also agreed that cargo liquefaction “has not yet been properly accounted for by international regulations,” and was of major concern for shipowners. DNV GL found that an ore carrier’s tank boundaries were not always assessed for the possibility of cargo liquefaction. “If it does occur, the pressure on the non-horizontal cargo hold boundaries can increase by a factor of two or even three,” said So¨nke Pohl, Key Account Manager and Ship Type Expert for bulk carriers at DNV GL in Germany. To help customers tackle the issue, DNV GL has worked with several shipping companies to prepare a guideline for the design and operation of vessels with bulk cargoes that may liquefy. The intention of this guideline is to raise the awareness of the risks of cargo liquefaction on ships, and to describe what mitigating actions may be taken to reduce such risks. Hopefully, when the IMO’s CCC 2 meets, it will be equally proactive as DNV GL and take urgent steps to amend the Schedule for bauxite by making recommendations to the IMO’s Maritime Safety Committee so it can then amend the IMSBC Code. If not, yet more lives could be lost on South East Asia’s deadly mineral trades.